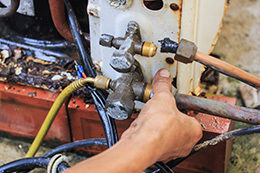 Has your heating or air unit decided to go haywire and stop working? Are you having issues with its efficiency, seeing rising bills, or just overall unhappy and wanting an upgrade? If so, you may be in need of a Charlotte AC company’s services. Calling a technician from time to time can be the key to leading a more comfortable life. They can make sure that your current heating or air unit is in working order, repair broken pieces, or completely upgrade and install a new system. If you’ve been having troubles with rising energy costs and don’t know what’s causing it, a Charlotte AC repair business should be able to clear up the doubts and make sure that your unit is working as efficiently as possible, rather than draining your wallet every month as a result of stuffed up ducts. Face it – your AC unit is more vital to your everyday comfort than you think, and keeping it in working order is important to your overall sanity (especially in the summer) and your energy bills. Charlotte AC repair companies are here to make sure that everything works properly and that you aren’t throwing your money out the window every month due to a broken AC unit. An ounce of prevention is worth a pound of cure, and this is true even in the heating and air unit industry. Servicing your air unit is the key to avoiding sudden utility bill spikes and emergency repair bills. We’re here to help whenever you’re getting suspicious about what your AC has been up to.